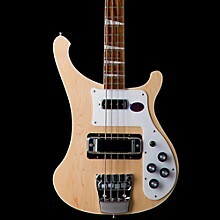 The Rickenbacker 4003 Bass is famous for its ringing sustain, treble punch, and solid underlying bottom end. 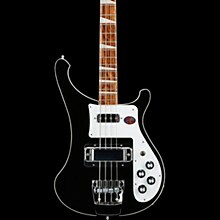 It's also famous for its distinctive, elegantly curved body shape, accentuated by a subtle strip of binding, deluxe triangular fretboard inlays, stereo output, neck-thru-body construction, double truss rods, and high output single-coil pickups with wide response range and brilliant clarity. 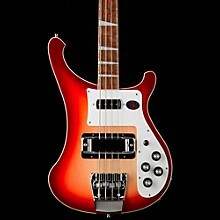 The Vintage Tone Selector activates a capacitor in the treble pickup circuit to emphasize the high end. Pressed in, you get the familiar 4003 sound, pull it out to add bite and crispness. Includes case. One year warranty on finish; otherwise, 5 year warranty from date factory-stamped on warranty.